Thanks to Facebook, I got several recommendations for the duck pond at the Arboretum (10000 Research Blvd). I happen to love the Arboretum area, and it’s not too far from my house. We stopped at the store to pick up some cheap bread for $0.88 a loaf (bread doesn’t have a chance to go stale in my house, so we always have to buy what my girls call “duck bread”), and off we went. The Arboretum is always a fun place to take kids. It’s mostly shaded, with large, grassy lawns and plenty of areas for little ones to run, play, and explore. We’ve taken picnics there, or just stopped to hang out after eating lunch at one of the nearby restaurants. To find the duck pond, we headed all the way to the back of the park. The beautiful entrance to the Arboretum, in between Restoration Hardware and Amy’s Ice Creams. This is only one of the grassy expanses where kids can run and play. Head to the end of these paths for a great view. Beautiful scenic overlook of North Austin. There’s a little path to the left of the overlook that leads down a winding trail. 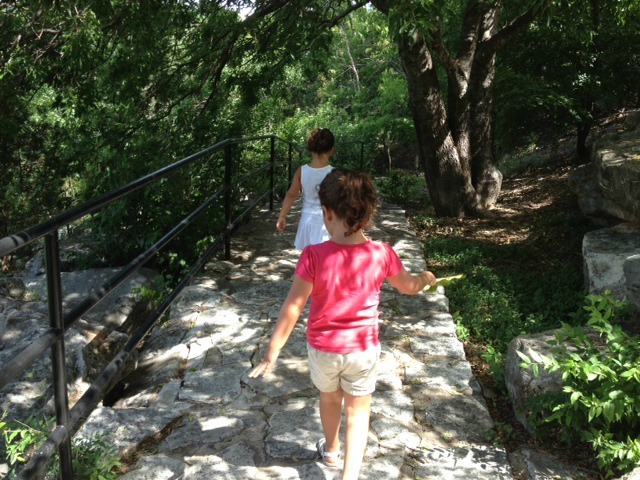 It’s paved with stones, but pretty rough and can get steep at places so I discouraged my clumsy girls from running. There’s a handrail available. Use a stroller at your own risk, and remember, you’ll have to push it back up. 🙂 You can also access the pond from Arboretum Boulevard, which runs around the entire shopping center. The pond is to the south. Make note that there’s only curb parking in that area. And then finally! You’re there! Your kids thought you would never make it! They didn’t believe you when you said there was a duck pond! They thought you dragged them to the store for duck bread and then lead them down a crazy winding path for nothing! But then! She said she had her own duck. The wonderful thing about having two 5 year olds and a 3 year old is that little outings like this are still such an adventure. They were enchanted by the ducks, the geese (who were thankfully friendly and not aggressive – one of my girls had a bad goose experience at another pond), and even the grackles. Geez, to be of an innocence where a grackle is your friend! We hung out at the pond for maybe 30 minutes? It was late morning and nice in the shade, and the kids were having a blast. When the ducks got a little full and wandered off, that freed up some bread for the birds and turtles. Yes! Turtles! They didn’t come out of the water, but the girls squealed with delight as they poked their little heads up to get some soggy bread. After some cow time, we headed over to see another cow, the one on the door of Amy’s Ice Creams. Sometimes you just have to have ice cream for lunch, you know? Especially when you have some Amy’s dollars to burn. Our morning could have easily come to an end at this point, but thanks to our ice cream lunch, we weren’t in any hurry, so we headed over to the nearby Barnes & Noble for some book browsing and air conditioning. It was a great way to kill a half hour or so, and with three kids, I’m all about killing time. Plus, they were learning and stuff. All in all, the Arboretum is a great place to turn to when you just need to get out of the house. Lots of open space, ducks, cows, and plenty of window shopping at the nearby shops makes it quite the adventure for the younger ones. Have you visited the ducks or the cows at the Arboretum?